The title Funkstamatic was inspired by the band's favorite smartphone app Hipstamatic. At once 100% modern and very retro, it takes snapshots that look like they were made in the 1970s. In much the same way, the album is a collection of musical snapshots with a distinctly vintage sound. Raw, analog funk instrumentals likely to please the hiphop crowd, Herbie Hancock style cinematic jazz funk and northern soul style vocal tracks make for an album that's as versatile as it's funky. Over two years in the making, Funkstamatic is a clear step forward from the rootsy beginnings of Euro Cinema's debut album "Ten-4!". Where that album was all about Blue Note style Hammond jazz, Funkstamatic is funkier and much more varied. One reason for the variation on the album is the different musical guests. Susanne Alt plays flute and sax on The French Confusion and Der Alte. The latter is a version of a famous German Krimi soundtrack from the 70's - recorded with the blessing of legendary composer Peter Thomas himself. Ploctones sax player Efraïm Trujillo has been performing live with Euro Cinema with spectacular results, as can be heard on tracks like Ducktape (previously a Dutch Radio6 'Schijf van 6'). Other noteworthy tracks are Koekwaus, which appeared on BBC DJ Craig Charles' latest compilation album, and the vocal tracks featuring Sanne Monster (ex Laura Vane & the Vipertones). Add AIFF's irresistible Afro Cinema Remix of the title track to the equation and you have an album that makes good on Euro Cinema's tongue-in-cheek promise to listeners: we're gonna party like it's 1969! Euro Cinema is a Dutch funk group. Groove oriented, jazz influenced and led by a twin attack of roaring Hammond organ and chicken pickin' guitar, their energetic funk sound often reminds listeners of a B-movie soundtrack - hence the name! Euro Cinema is Tim den Heijer (guitar), Niels Piay (drums), Dennis Orsel (bass) and Rob Schepens (Hammond organ). The band took off when several influential DJ's picked up the track Euro Boogaloo off the first demo. The group started gigging on a regular basis and built a reputation for their frantic, sweaty live shows. In 2010 Euro Cinema had the honor of opening Saint-Paul Soul Jazz in France, the number one festival in the world for raw funk. 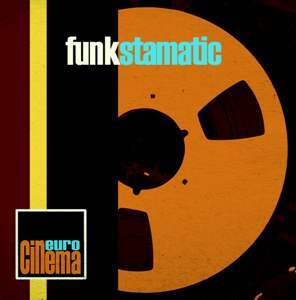 In 2010, Euro Cinema released the vinyl single Brooklyn Groove on the U.S. funk label Hammondbeat Records. The single got airplay around the globe. In march 2011, full length album debut "Ten-4" followed. It was presented at Amsterdam's music temple Paradiso, whose staff named Euro Cinema "Holland's hottest souljazz/funk band". Like the single, the album was produced by Dutch funk mastermind Phil Martin, known for the Soul Snatchers and Laura Vane. It received much acclaim from funk aficionados around the world. In 2012, Euro Cinema collaborated with saxophone and flute player Susanne Alt to record the single Der Alte on Légère Records, home to first rate funk acts like The New Mastersounds and Mocambo Allstars. 2013 saw the release of the band's heaviest, all-analog funk tracks yet. The track Koekwaus was selected by BBC's Craig Charles to appear on his compilation Funk And Soul Club Vol.2 (Freestyle Records). Ducktape, a collaboration with top jazz sax player Efraïm Trujillo, was Record of the Week at Dutch Radio 6. The new album Funkstamatic is released march 2014.